Description: Mentzelia laevicaulis grows a weedy-looking, branched stem which may reach a meter in height. The plant bears capsule fruits containing winged seeds. At the tip of each branch blooms a spectacular yellow flower. The star-shaped flower has five narrow, pointed petals with shiny yellow surfaces, each up to 8 cm long. Between the petals are long, thin yellow sepals. The center of the open-faced flower is filled with a great many whiskery yellow stamens. Beneath the petals are long, curling bracts. Leaf: The whitish-green stem and its lateral branches bear the occasional triangular sawtoothed leaf. 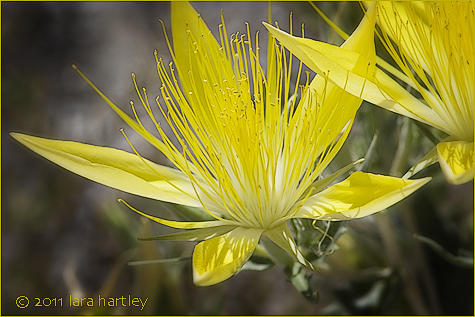 Notes: Mentzelia laevicaulis, a dicot, is a perennial herb that is native to California and is also found outside of California, but is confined to western North America. Distribution outside California: to British Columbia, Montana, Wyoming, Nevada. This photo was taken on July 22, 2007 on Onion Valley road, Eastern Sierra, Inyo County, California.